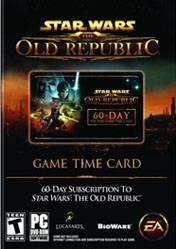 In Star Wars: The Old Republic, you create your own Star Wars saga! In the Massively Multiplayer Online Role Playing Game SWTOR by BioWare and LucasArts, the first MMORPG with a highly influencable story, you will explore an era 3,000 years before the rise of Darth Vader, when the war between Republic and Sith Empire divides the galaxy. Become a Jedi, a Sith or choose from a selection of other classic Star Wars classes in SWTOR. Your decisions determine your personal story and will lead you to the light or the dark side of the Force. On your way in SWTOR you will meet fearless companions who will fight at your side but might also betray you if they don't approve your decisions. Fight with them in dynamic Star Wars battles and get together with other players to take on the massive challenges that lay ahead of you in SWTOR.